We are committed to being a safe place to ask faith questions. We welcome everyone's questions and we love to wrestle with the difficult questions of life. If you are new to Bible study or have studied for years, you are welcome and encouraged to join a group. For help finding the right group, contact Rev. Sue Trigger. 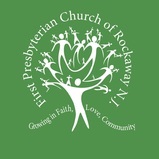 ​Growing in Faith, Growing Love, Growing in Community is what we are all about at FPC. Our educational ministry offers a variety of opportunities to study, pray, build friendships and discover where God is calling us in the community. Sharing our personal faith stories is part of the journey. Last year a number of members volunteered to share their stories at our Evangelism Sunday worship service. Segments of those statements were recorded by a group of volunteers and came together in a video Affirmation of Faith. You can enjoy the video by clicking the arrow in the image below. We are a congregation that loves to spend time together learning, exploring, and having fun. From our Sunday school classes to youth fellowship, we have opportunities for everyone to grow in faith together. Be sure to check out the pages for all of our education opportunities: Feasting on the Word Sunday school and Monday adult Bible study, Tuesday Adult Bible study, Jr. High Youth Fellowship, Sr. High Youth Fellowship and Vacation Bible School.